POST UPDATE APRIL 4, 2019 – Since having written this post back in May of 2016, I have now started making over $10,000 a month. If you want to know HOW I do it, then you can check read how here! We were below the poverty line. And my husband was working a soul-sucking corporate job as we struggled to get by. To be honest, it was hard to imagine a future where we could really prosper and actually reach our dreams. And our dreams were to travel the world full-time and see amazing sites and meet wonderful people. We wanted to experience life outside of our tiny, dark apartment, and a car that kept on breaking down in the middle of WINTER. My husband was searching for hours for ways to work online. There were so many ideas out there, but there were no great fits. Some of them required skills we didn’t have or VAST AMOUNTS of time to make it work… and we didn’t want to wait years. But then it all changed. One day, my husband finally ran across an amazing interview with a blogger named Rosemarie Groner from The Busy Budgeter who was making over $5,000 a MONTH from blogging! And it didn’t take her years! In fact… it took her months. We were making MORE than my husband’s corporate job! $3,000 in 3 months after launching... we were stunned and we know we couldn’t have done it without God’s help (seriously). Launching a blog was one of the best things we could have ever done! And since we’ve started blogging, things in our lives have looked completely different. We went from living below the poverty line and living paycheck-to-paycheck, to making over $10,000 a month and traveling to countries like Morocco, Japan, and France. I’ve been able to wake up when I want to and see parts of the world I would never have gotten to see otherwise. Paris is pretty in the Fall, you should go! And I know that it will give YOU the ability to quit your dead end job, spend more time with your family and friends, and give you incredible time and money freedom. There are honestly so many opportunities blogging will give you. But Wait… Is Blogging for Me? Have more time with your children and/or spouse. Have more time with family and friends. Be able to travel and work wherever you want. We have SO MANY reasons for wanting to find a great way to work from home. But.. is blogging the right way for you? Now you might have looked into other work from home options only to find they required things you didn’t have: a certain degree, specific skills, a few years of experience, hours you couldn’t work, etc. But that’s NOT your fault! We all have different paths we took in life and if you decided to not go to college (like me) or the hours aren’t reasonable for you, then you don’t have to feel bad about that. And that’s why I love blogging so much! With blogging you’re able to set your own hours, you DON’T need a degree, and the only thing it requires to start is a computer, some writing skills, time, and a minimal investment of money. And the best part is that YOU are in control of how much you make. There’s no boss saying how much of a raise you can have this quarter or what kind of pay you can start off with. It’s all up to you and the amount of time and money you invest into your blog. SIDE NOTE: Also, I’m here to help you out when first getting started! So feel free to join my readership at the bottom of the page to get exclusive tips every week AND the tools I use to have a successful blog! BUT, if writing is something you really don’t like doing, then I would definitely not start something you aren’t going to enjoy. Also, if you’re needing to make more income very quickly, then I would not consider blogging as an option. There are companies that offer online jobs and start paying within a couple weeks. But What if I Have Time Constraints? Well that’s why blogging is so amazing! There’s NO ONE telling you at what time to start and stop; your schedule and pace is all up to you! And one of the best parts is that I’ve seen single mothers like Sarah Titus start a blog and start making $10,000 A MONTH IN A YEAR! She decided that she wanted to work later hours so that she could get to a higher income faster. And it just goes to show you that no matter what your life circumstances are, there are always ways to make it work. PS – Even if you shoot for $10k/mo by the end of 12 months and work hard, but don’t make it, think of where you’ll be! Will you STILL be making a full-time income of $3,000 or $5,000 a month with your blog? When we listened to the interview with Rosemarie (The Busy Budgeter), she had one huge way you could get income and viewers to start rolling in. And that was Pinterest. Getting hosting for my blog is one of the BEST things I could have ever done. Now many people think that they can easily start a blog for free on WordPress.com or Blogger. But you DO NOT WANT TO DO THIS. If you start a blog on a free blogging site, you won’t be able to make income from them. Signing up for ad networks and affiliates will be impossible. SIDE NOTE: It’s also dangerous since they can take down your site for no reason AT ALL and you’ll lose all of your hard work (this isn’t a joke!). So what do you want to do? You want to sign up for hosting. Hosting is basically like renting a space on the internet so you can have your own site. It allows you a lot of flexibility to work with companies and not have to worry about a site like Blogger kicking you off for no reason at all (I’ve known bloggers who’ve had this happen to them). Bluehost is what I use, and I wouldn’t recommend them if they weren’t a good company. They’re helpful and will guide you through the process if you have any trouble. Also, if you click through my personal link, you’ll get the special deal for $2.95 a month, ALONG with a free domain name (which is really awesome)! However, I don’t know how long this deal will last, so you’ll want to jump on this! You can get the special deal for hosting here! Now some people might be worried that they have to pay for hosting because they’re on a tight budget. I was at the EXACT same place when I first purchased hosting with Bluehost. But I realized something; if I put money in now, I was going to be able to pay myself back multiple times over later. And I have; because I went with Bluehost for my hosting, I can now make enough to support two people and travel full-time. You can sign up for Bluehost here and get hosting for just $2.95 a month. PS – If you want a step by step tutorial for setting up a blog with Bluehost, then check out my post that’ll show you exactly how. It’s super easy! Click here to download my free printable checklist for creating a VIRAL blog post! This social media site is great in that it’s basically a visual search engine; once a person finds a pin (a picture) that they like (such as a recipe or a helpful tip), all they have to do then is click on it, which will enlarge the picture, then click again and they’ll be taken to the site. And unlike Facebook where you have to pay for ads if you want to get any viewers at all, Pinterest is all about organic reach (organic meaning not paid, people just simply finding your site through search or shares). And once it’s out there and getting pinned (shared), it doesn’t stop. With Facebook, once you create a post and put it out there, it may be seen for a day or two, but unless it’s widely popular (like this..), it’ll be out of sight and out of mind pretty quickly. Group boards on Pinterest are also the main key to getting a lot of viewers. For those of you who don’t know, when you have a Pinterest account, you can get onto “group boards,” This is where someone who owns a specific board invites you to join and pin on their board. So basically any pins you have will get in front of their audience. So let’s say you ask someone (through their provided email or contact on their site) to join their group board, and they have over 100k followers, then BAM, your pins are going to be seen by the fair majority of their followers (sadly not all of their followers will see you.. because getting sick or work or crazy relatives visiting happens). Quick Note! In order to find group boards, you can go to PinGroupie which will provide you with any and all group boards on Pinterest. There is also an option to search for group boards according to the highest amount of followers or repins (group boards with high repin rates means they have a very active audience that likes their high quality content). An Extra Quick Note! Sorry guys, but I can’t let you scroll down without you knowing this. Don’t be intimidated by boards with a ton of followers and/or only a few contributors (people who are pinning to that group board). The bigger numbers and small amount of contributors may seem exclusive or intimidating, but if you craft a very respectful message that let’s them know that you love their content and will follow their board rules (like no spamming with the same pins), as well as help them out with anything if they ever need it, then it shouldn’t be a problem. Yes, there will be quite a few times you get rejected, but if you apply to a huge number of the “unattainable big blogger group boards,” you will get accepted which means a few hundred thousand or a few million new viewers for your blog’s content. It’s how we did it and were able to get millions of new eyes on our pins. Being small shouldn’t limit your reach. Now if you don’t know how to use Photoshop, or it’s out of your price range, then check out PicMonkey. It’s a free online picture editing site (although you can upgrade for $4.99 a month or $33 a year.. pretty darn cheap), and if you’d like a tutorial on how to create pins with it (or awesome blog post pictures in general), then check out The Busy Budgeter’s post on the subject. She also gives a few sources on where to find free public domain photos (photos that anyone can use without getting sued.. alright so that might be a bit dramatic). I also have a few favorites such as Unsplash, Pexels, tookapic, IMCreator, picjumbo, Life of Pix, and StockSnap.io. Quick Note: Hopefully this is quick… alright so when you’re creating pins for Pinterest, make sure they’re long (vertical) and around 1000 x 1500. Square (horizontal) photos on Pinterest turn out small and won’t be seen as well. Also, you’ll want to choose photos that have warm colors, and without a face. Pins with no faces (you can crop the face out of the picture if needed), get more repins. Also, if you’re creating a post on a money subject, get a photo with money in it; it catches the eye and gets more repins. When we started to create content we did a couple of things. First, we hit people’s pain points: places where we knew they needed help. We noticed that a lot of bloggers out there would create content that nobody read because well.. it didn’t hit a pain point. I honestly don’t need to know how to be a dog whisperer (although that could be cool..). In short, create content that speaks to problems that people want fixed now. You don’t have to do this all the time, but just remember that you want the amazing 20% (pins that bring in a lot of traffic) that’ll bring them to the rest of your great 80% (the awesome content on your blog). Second, we looked for posts whose titles over promised and under delivered. Then we took their subject (with no copying of course) and over delivered in all of the areas they missed. We exceeded the expectations of our readers with content that genuinely helped them out. Think Buzzfeed or The WHOot. Both find quality content to share with their readers and they do it well. And as long as they’re referenced, you can use their photos to link back to your site and the curated post. One of the things that The Busy Budgeter referenced in the podcast was the Elite Blog Academy. It was an online class that she took to get her numbers and income raised. After learning about this, Silas and I debated whether we should take it since it was around $499 in total or $49 a month. We decided we’d go with the monthly plan and haven’t regretted it. The Elite Blog Academy really helped us learn more about how to create great content as well as make profit from our blog. We’d highly recommend it. However, it only opens up once a year (around February), so check out their page and sign up for their wait list. Once they open, they’ll send you an email and you’ll be able to apply. Many people wonder if they should start their email list right after they launch their blog. But guys… those first few subscribers are the most important ones you’ll have. It’s been shown that the ones that stick with you even when you’re just beginning will be your most loyal readers and they’ll be more likely to buy from you when you offer them a product. So Which Email List Builder Should I Use? Well you could use a free service like Mail Chimp, but there’s a couple things you should know. First, there have been so many times where I’ve heard bloggers complain about how they regret starting out with free services like Mail Chimp. Because when they decide to switch over to a more efficient email list builder like Convertkit, it take hours for them to transfer their entire list. It’s a complete headache and takes DAYS to do. Now the reason why I suggest Convertkit is because their services are SO EASY to use! I am not tech savvy… at all. In fact, I get seriously frustrated when something takes way to long to figure out. But with just one video tutorial, I was able to easily understand everything. Convertkit is seriously intuitive and simple. Now the monthly cost for Converkit is $29.99 a month which is basically 5-6 Starbucks drinks in a month. I get it, it’s so much easier to sign up for something free when you’re first starting out, but the ease of using Convertkit is so worth it (and you won’t have to deal with moving all your subscribers over later)! You can check Convertkit out here and if you have any questions about it, feel free to ask me! PS – Feel free to check out my post on how to start an email list! It’s super important for having a successful blog! Before Chasing Foxes had been launched, we worked hard to get onto group boards, created at least 40 blog posts, and did a TON of research. This wasn’t something that we just happened to start at the beginning of April and somehow got a lot of viewers and income (but that would be pretty awesome if it were true). This took us around three months, and we really don’t want you to think that any of the success we had came easy. But that’s the reason for this post isn’t it? To help you out in your journey so when you start your own blog, or if you’ve already started, things will be made a lot easier. Well we hope we were able to provide you with helpful information and if you have any questions or you’re a blogger that has some tips of their own, let us know in the comments below! We’d love to hear them! I am beginning the research phase for a blog. I have been reading continuously ” how to…” Blog posts. This post truly is the clearest post I’ve read so far. What fantastic information. I feel like you have given me a much clearer path to get myself started. Thank you so much for taking the time to put this post together. Hey, thank you so much! I really like providing value, especially since I was in your shoes not that long ago. I was searching through all of those “how to” posts as well and getting tired of hearing all the same info. And when Rosemarie (The Busy Budgeter) just told what she did and how to do it, I felt like I was finally headed in the right direction. I agree thank you for this info. I am looking to start a blog too. I want to quit my job and do this full time so I can be at home with my kids. I will try all of your helpful tips. Kendall, you can SO do this! I know some awesome mothers who are bloggers and have been able to do it full time and stay home with their kids. The Busy Budgeter is one so you should definitely check her out and see the info she has to offer. 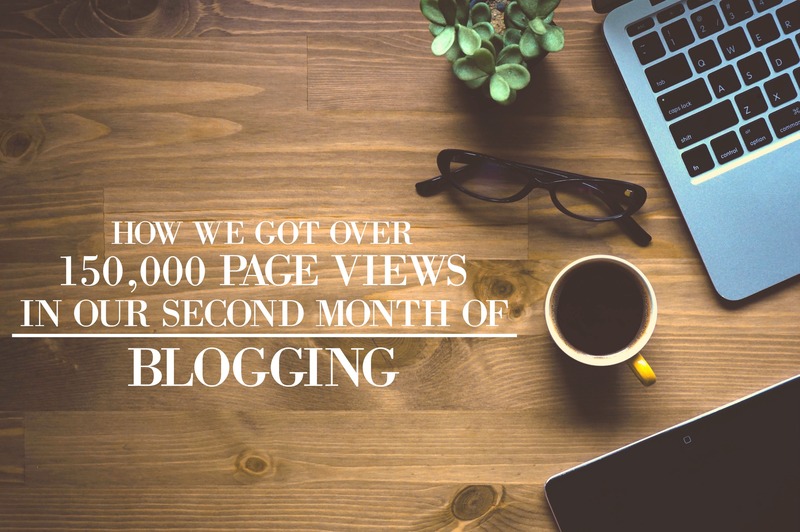 Also, take a look at Sarah Titus’ story How I started Making 10,000/month My First Year Blogging. It’s one of the stories I read when I was first getting started it inspired me also. This is amazing.. I have read so many “how to start a blog” posts from other bloggers and they have the same stuff repeated over and over again. I swear if I read “Create great content” one more time, I’m going to snap! Your post was so refreshing and real! Thanks for sharing! Way to go! Congratulations on your blogging success thus far! I am in the research phase of beginning my own blog. I am a teacher and intend to continue teaching, as I am not looking to make a profit financially, but personally and professionally. I am looking to build a Professional Learning Community to learn and share ideas and reflect on what works and what doesn’t. It is my hope that I will continue to develop my skills and continue to grow as an educator. I don’t want to be some of the teachers I had when I was in grade school (bored and boring, tired (it may be too late for this one) underwhelming, unapproachable, judgmental, and as if they couldn’t wait for us to leave) . With that, your advice will not go unheeded. I am a pinterest addict which is how I came across this post, so the tips for using it are extremely helpful. I also especially like the idea of hitting a pain point. Thank you for this post and may you continue to prosper! Hey I’m so glad I was able to help you! I fully encourage you to go after this; blogging (even with all of the hard work) is very life-giving, especially when you’re helping others. I have a lot of respect for teachers like you so keep on doing the great work! This was amazing! I’ve been blogging for a couple months and my page views are slowly increasing. I just signed up for Boardbooster but I love your post about writing content to solve problems NOW! I’m going to work on that. I would love to know your play by play with Google Ads. I have had add above the fold and all that jazz and I’m just not bringing anything in. Did you do something other than placement? The Google Adsense site is so intimidating and overwhelming every time I try to figure out how to get more income. Thanks so much!!! Thank you so much Krystal! I’ll be doing another income report on the first of July and telling more about how I optimized my Google Ads. I’ll email you as soon as it comes out. 🙂 Also, love your blog! That would be amazing. Thanks so much!! Thank you for sharing your knowledge! My blog has been live for 4 months and I don’t have nearly 150,000 pageviews but I also didn’t do as much prep as you did before launching (I got excited and impatient…). These tips are very insightful and I can’t wait to utilize them and hopefully see growth like you did! I am a part of 3 group boards on Pinterest already. How many do you suggest being a part of? I don’t want my whole profile to be group boards but I can’t say no to more exposure. Hey Lauren, I totally get it, my husband and I were pretty excited about getting started. In fact, the only thing that was holding us back was waiting for our blog design to be finished (I’m glad it was delayed though, it helped us get further along I believe). Also, your blog looks GREAT! And the trick to group boards is to get on as many as you can; there are two reasons for this. First, once you get on group boards that have a high repin rate, there’s more of a chance for your pins to go viral. Second, the more group boards you have, the more legitimate of a blogger you look. Sounds shallow, but that’s what many people think when they see a blogger’s Pinterest profile. I’m on at least a hundred (probably will downsize to just the ones that have a good repin rate). I hope this helps! Great post! I’ve been blogging for a couple of months and am a fellow EBA student too! You have some great tips that I’m going to start following. Are curated posts and round-ups the same thing? I was thinking that you had to have permission to use a photo from another bloggers post. I think this might just be the BEST, most helpful, plain, real and realistic post I’ve ever read about starting a blog. And like the other commenters… I’ve read A LOT! Hey, thank you Michelle! I’m so glad I was able to help you! Also, your blog is looking great, just check it out! Thanks for the legitimate info! I have read many other how too articles only to finish them feeling more confused than when I began. I definitely want to be a SAHM mom one day in the very near future. I really think this will help me get there! ? I totally know how you feel! A lot of the time it felt like I was being duped into reading their post because of their title that over promised. I never really felt like I gleaned much good information when I first started to do research. Also, I’m glad I was able to help you, feel free to reach out to me if you have any questions! I will admit it was the busy budgeter blog which also gave me the final push I needed to start my own blog. Your advice of having 40 posts ready to go before going live is good advice that I wish I had been given earlier. Thank you for sharing and for your honesty. I’m glad I was able to help you out Jenn! Amazing! Thank you for this, like so many others I’ve read a ton, and can’t wait to continue on the journey with all the wonderful advice and links given!! I have been reading your site and it’s so very informative and helpful! Especially to me as a newbie blogger. I do have one question: would you suggest the individual keep their personal Pinterest account or make a new one with their blog site? Thank you!! Hey Melissa! Definitely create a new one. I would suggest creating a Pinterest business account, that way you can link it to your blog (just Google Pinterest business account and it’ll pop up 🙂 ). I hope this helps! I can only agree on all the “how to” blogs. I finally started a blog and your page really helped me to set it up. I am in my second month of blogging now and can see some traffic and a few cents of income. I hope I can progress much more soon. Would you be able to tell me/us how many page views you had when you had some real income with your blog? Hey Lisa! Thanks so much for your kind words! And as for seeing real income, I was told by Ruth Soukup, who did The Elite Blog Academy, that you will start to see good income when you reach around 100k views per month. She was definitely correct! I love y’all’s blog! Thanks for sharing this information – it’s definitely helping me as a blogger who just started out! I looked into PinGroupie like you said but I’m still having trouble finding group boards for lifestyle blogs geared toward college gals. Any suggestions? Thanks for all the tips and tricks! Thanks so much for this! I’m a college student looking to start a college and Greek life blog all about things from college relationships to note taking tips! This is a great guide to help get me started! Thank you! Hey thank you so much Caitlin! And I’m so glad I could help you! If i were to buy photoshop which service should i purchase? i see that there are many applications and they are all bundled up at different price points. I love this post it was very helpful! Please and thank you! Hey Jenny! Both Photoshop Lightroom 6 and Adobe Creative Cloud come highly recommended. I hope this helps! Killer information, Silas and Grace! I just launched my organic gardening blog last week, kind of with your similar mindset, that I want to really dig into information that other garden bloggers are only scratching the surface of. I havent had luck with repins on Pinterest as I don’t have a lot of followers – and I never even considered joining group boards until NOW! Oh boy am I excited! Excellent stuff, thank you for being so genuine! Hey thank you so much Fran! And I’m so glad I could help you out! Wow, this is one of the most informative straight forward how to’s so far. Too often I read a guide and have no more clear cut information after than I did before I read it. I made myself a list of what I’m going to do right now. Thank you Thank you so much. I’m feeling excited again. Hey, you’re most welcome Kelley! I’m so glad I could help you out! In your article you say that you can curate as a way to create meaningful content. Do you suggest getting permission before posting? Some consider your advice, “As long as they’re referenced, you can use their photos to link back to your site and the curated post,” touchy because of claims that you can get sued for using photos & content without permission. Is there a black and white answer to this? Hey Grace and Silas! Loved this post. I just hit my one month blogging mark! Exciting, but I still feel so overwhelmed! You guys helped so much and I’m taking in all the advice! Thank you guys! Whoo hoo! I’m so happy for you! 🙂 And you are most welcome Savannah! I LOVE THIS!!! You’re so right – I get so tired of reading posts that say “you need to get on Pinterest” and nothing else. It’s like giving only half the information needed to really help you. I love your transparency and willingness to guide fellow bloggers! I started my blog As Said by Ed to have a creative outlet and am absolutely in love with sharing all of my “unsolicited opinions, observations and advice on life.” Much to my surprise, there are people who read what I have to say 🙂 Amazing post!! I’m a young mother (21 to be exact) and am going through a divorce. My biggest goal is to be able to stay at home with my son and give him a great life. I’ve been researching starting a blog for over 4 months. Your post was very insightful! Thank you so much! You’ve given me another boost of confidence that I can make this work for my son! Thank you so much for the information. You’re right about hitting the pain points. I read so many posts on using social media but they never quite say how. Your posts are simple and to the point. Great tips and advice. God bless? I am doing my TONS of research before starting a blog and this is such a helpful post along with the income reports! I do have a couple questions. When you created your 40 blog posts and got into group boards before launching: 1. How did you decide how frequently and in what order to post your pre-made content? 2. How did you ask to join groups when you didn’t have a blog domain started? I want to thank you so much for this post. Reading it is what FINALLY got me off my backside and to work creating a blog and an income. I haven’t had your success *yet* (my blog is still a baby) but I believe that with work, perseverance, and a willingness to learn and try I WILL get there. Please keep up the good work and I look forward to seeing you soar to even greater heights! I’m so sorry for the late reply Kate! I believe in you, you can do this! Thanks for sharing! I definitely need to do more on pinterest! Really great article, u certainly got the pain point and exceeded expectation. Seriously , this one line of yours has given me the answer for “How to write great content’ , than so many articles i have read so far. I am a student, doing masters and planning to start a blog of my own.I have read this particular article 2-3 times till now (not that i dint understand it , but because i was so impressed) , and finally decided to comment, though i have never ever commented anywhere till now(Kind of scared that way). Thanking you for giving me a clear cut starting point. If possible please write more articles about preparation for blog starting, SEO used, etc. That would really help. Keep your work up.All the best. Thank you SO MUCH Shilpa! I’m so glad I was able to inspire and help you out! Also, I think it’s very smart of you to reread the post a few times, that’s how I was able to take in and remember great info from other bloggers when I was just starting out. Hey your blog has truly inspired me! I am starting to do tons of research so I can start my own! I was just curious if you got a new design for your blog right off the hop or used a free one that was provided and what you would recommend before launching? Wow! I’m so glad I was able to help and inspire you! As for the designer, I had a good friend of mine do it for free (of course we’ll be paying her as a surprise for being so kind by doing that for us 😉 ). I know this is an older post but I wanted to say I’m so inspired! I am in that soul killing job right now and desperately searching for a way out. I want quality of life with my little ones but still be able to provide. So many of the “how tos” I’ve read just go round and round without giving real advice. Thanks for writing this! Now I feel I have a map to get the ball rolling! I’m so glad I was able to help you out Angelle! I also made a post very recently that’ll help walk you step by step in creating your own blog and a post that goes into more detail about how to get great views and income. I was brought to tears by this post-because I am happy to hear of your success, I believe in Jesus & God, and I am new to blogging and know that this thing (blogging for a living) is real! So happy for your success and look forward to your continued success! Hi Grace, Along with all of the other readers I have to thank you for a great, informative post. I have been researching writing a blog for months, and trying to be somewhat clear on everything before I actually start posting content. After I purchase my domain name does my blog immediately become “active” or “launched?” Or can I take a month playing around and posting content before I go live? I’ve been to website’s before that say under construction or coming soon. Thank you for any advice and congratulations on your blog success. Grace thank you so much for providing this content! I started my blog about 4 months ago and have been doing a lot of research but yours has been the most helpful thus far. I have applied for AdSense and was approved today. Now I am going to work on creating ads and networking through Pinterest like you suggested. Do you have any advice for a new blogger regarding AdSense or Pinterest? My husband Donovan has been so supportive and I want to help our family and I know this blog will pay off. Any advice would be greatly appreciated! Keep up the hard work and the amazing blog :). God bless! Hey Ashley, I’m so sorry for this late reply! I’m very glad I could help and inspire you! As for Adsense, I would use the WordPress plugin and have the majority of your ads at the very top of your page and in between your content. And when it comes to Pinterest, I think I should point you in the direction of my post on How I Made Pinterest my Full-Time Job. I’m not trying to be lazy, I just know it’s packed with great info. I hope I was able to help you! Happy holidays! Hi Grace, the information you’ve shared about blogging is wonderful. The idea of starting a blog has been in the back of my mind for a few months. Your posts have given me a push that I needed badly. My passion is research, and yes, there are times when I spend too much time on a given topic. You wrote about finding a theme. Please elaborate. I’m all over the place. Thank you for the well-written posts. Hey Marla! I’m so glad I could help and inspire you! This is so exciting! I have a blog but have done zero with it, it’s so overwhelming. Can I ask, what were your first 20 or 30 posts about, ones you wrote before your blog went live? I just don’t know where to start! Hey Amanda! I’m so glad I could help and inspire you! My first posts were mostly relationship (dealing with long distance, communication, etc. ), money (starting emergency fund, saving on groceries, etc. ), and some style advice (spring wardrobe advice, minimalist tips, etc.). Hello! I am a single mom of 2, one adult son and a 15 year old daughter. I have 2 years left with my daughter before she graduates high school and I so want to be at home to get her through. I am in between jobs and she loves the fact that I am at home…I love it too. I just need the income to be able to stay home and this is my answer. Thanks for all your inspiration and info and I can’t wait to get started!Now if I can just find something useful to write about! Hi Grace how are you? I just looove your blog! I am so glad you were the FIRST blog I found with How to start a blog and didn’t have to go through all the other people above had to! When you say “get into as many board groups as you can” do you mean before or after you already launched your blog? Thank you so much for all your amazing help! As for the group boards, I feel that it’s a great idea to get your group boards before you start you blog. That way, you have a great number of people to put your content in front of right away. I have been playing around blogging for a few years but my medical billing contract is up in two weeks and as a single mom with a special needs son, it’s time to make some money. Thank you very much for the tips. I’m so glad I could help you out Angela! Happy holidays! Wow! This post is awesome. I’m definitely going to be following along with you guys now. I’m new to blogging and don’t have much content yet but I’m working around my job and a new baby (excuses?) Lol. I love the part where you point out to compile other’s posts into one long post and reference them. I didn’t even know people were cool with that. Also, your Pinterest strategies make a lot of sense. I’ve just joined a few group boards and they seem to be working great. Although I still have minimal content, which most of it already needs TLC since I really didn’t know what I was doing starting out, I’m starting to see small increases in traffic. Thank you guys for being so transparent and actually helpful. Unlike the typical “how to guides” we all read. I’m also looking for ways to gain subscribers if you guys have any links for that, I’d love to read them. Hey Sean! Sorry for the very late reply! I’m so glad we were able to inspire and help you out! It’s really our passion to make things easy to understand and very transparent. These are such great tips, thank you so much for sharing! We’re glad to be able to help. I am pretty sure that I have had this post/article open on a separate tab for the last few days. What an absolutley amazing resource. Blogging has always been something I have thought about, but didn’t take the plunge until very recently (like the past week or so hah) I too was a little impatient and only have a few blog posts up, but I believe I have developed a good schedule moving forward. In a perfect world, I won’t have to go back to work full time and will be able to supplement my income enough to stay at home full time with my darling little turd of a son. I think coming across this article (through pinterest nontheless) is definitely going to help make this dream a reality. Hello! I just stopped by to say THANK YOU. A million times over. This is by far the most informative and honest post I have read about the steps needed to generate income on a newer blog. I am in the process of starting a travel blog, as my SO and I are quitting our jobs and leaving on a one way ticket around the world starting in December. I have read so many posts about the technicalities, which have been great (i.e. : setting up my blog, hosting my blog, creating themes, content, social media handles, etc) but this is the first post to really go into detail about WHAT to do with these, after I’ve created them. I am constantly brainstorming ideas for content and how to make my content unique. I also am already an avid pinterest user, so to hear how important pinterest is makes me very excited to start pinning my own pieces. (Thanks for the tip about pinterest groups! What a great thing to know). You have definitely gained a new reader/subscriber today. Cheers! So were you able to be accepted to Pinterest group boards BEFORE launching? That’s what I would like to do, but I’m not sure if it’s possible. I haven’t launched yet, but I already have over 300 blog post ideas, over 40 written posts, I have my business Pinterest account set up, etc. I really want to have as much as possible set up before launch! Thanks for the informative post! Hey Brenda! You’re doing great! 300 ideas and 40 written? That’ awesome! Yep! Start applying to group boards now. Get that set up so you can start to see traffic come in sooner than if you had waited. I am so happy I stumbled upon your post! I just started a new blog and am eager to gain more pageviews and readers, ans I found your post super informative, so thank ! I’m going to work on the group boards, we’ll see how it goes!